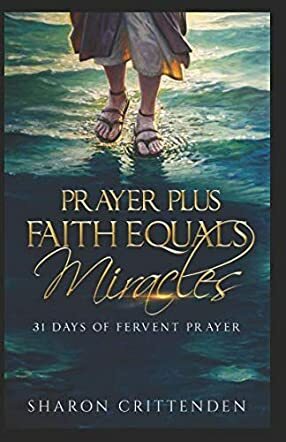 Prayer Plus Faith Equals Miracles is a 31-day journal written by Sharon Crittenden whose aim is to help the believer grow closer to God through prayer as they build their faith. The importance of prayer cannot be emphasized enough in a Christian’s journey and Sharon Crittenden encourages, guides and helps the believer in incorporating prayer into their everyday life. Each prayer in Prayer Plus Faith Equals Miracles is reflective and intimate, and touches on various topics that include gratitude, submission, intercession, praise, and declaration of God’s Word into a Christian’s life. Written from the foundation of applicable scripture on the topic of prayer, the book uses simple but effective language, making it easy for any reader to understand the content. When I saw the title, Prayer Plus Faith Equals Miracles, I had to read this book. In one sentence Sharon Crittenden explains the nature of miracles and their cause. As I continued to read the book, I was reminded of the great privilege I have of communicating with the creator of the universe while enjoying a close and satisfying relationship with Him. Through prayer that is backed by faith, I can tap into the supernatural and enjoy what God has for me. As I read through each invocation contained in the book, I could not help appreciating how each of them was designed in an intimate yet simple way. I liked the fact that the author, Sharon Crittenden, did not complicate what prayer is and that she incorporated the important relationship between prayer and faith.